Trying to bring my healing to a new level. 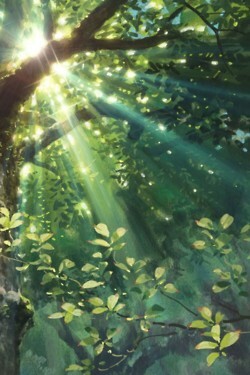 I visualize sunlight & moonbeams gliding through my intestines, bringing beautiful healing powers with each breath I take. With each wave of breath, there comes a new life, a new vibrance to my body. Unlblock the Chi. Let it flow. Breath into the whole body and allow the breath to reach your toes and back up to your head. These are things that I have been repeating to myself over and over again all week. I’ve been envisioning warmth, whit-light and valuable healing motions inside. Shedding layers of old ulcered and inflamed intestine walls, and visualizing oxygen being forced into each cell with re-newness and life. As I visited my acupuncturist this week for the first time in months, she said my Chi seemed to be blocked. I was holding it all within my mid-section. She was pretty right on with that observation. I always tend to hold my tummy in very taught, not mindfully. It’ just a subconscious area where I hold all my tension. After doing this for long periods of time without realizing it, the tension can build up into negative energy. I’ve been getting heartburn which she said can be caused by repressing all my energy in the mid-section. Chi gets “stuck” if you will and effects the organs from working correctly and the blood from flowing smoothly. I’ve also been having an increase in digestive upset so this is another reason why its easy to focus all my energy on that section. A simple suggestion by my acupuncturist: “Just let it all hang out.” So you know? I’ve been making a conscious effort to let the little tummy just hang and be free rather then repressing it in. Doing these affirmations above has helped me to see where I need improving. I need to deep breath more. 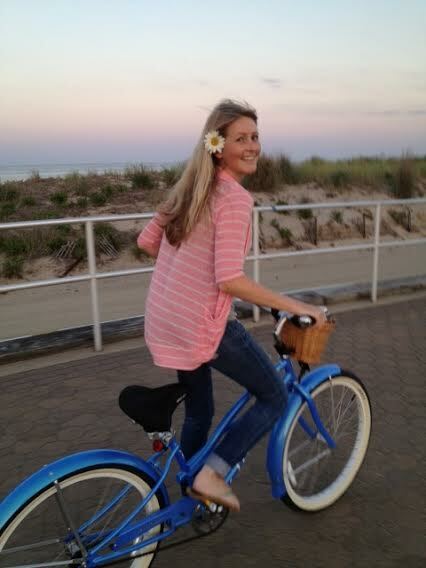 I need to focus on creating an overall energy flow throughout my body and not just where the discomfort is. Another turning point for me this week was when I started watching Dara Dubinet on YouTube. If you haven’t seen her yet, please watch her. She is beautiful, intelligent, inspirational and such a positive beam of light. She is a raw chef and makes videos showing what she makes in the kitchen while also depicting her active and positive lifestyle. She has motivated me to start eating more RAW again. I forgot how good it feels to eat mostly raw. For all the cheating that I have been doing this is what I needed. A little inspiration and reminder to where my healing path should lead. I need to take new steps to heal even deeper. 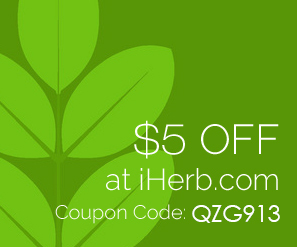 Green smoothies everyday! 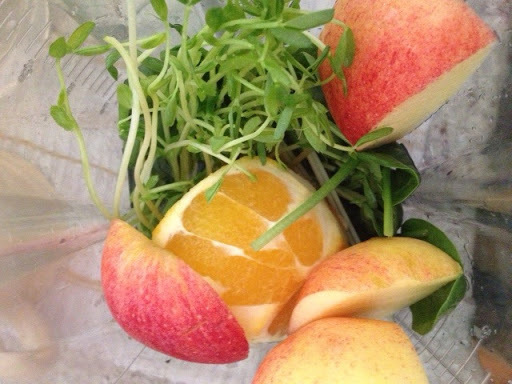 My new thing is adding an orange for a little sweet kick and adding sunflower sprouts for wonderful enzymes and living nutrients. 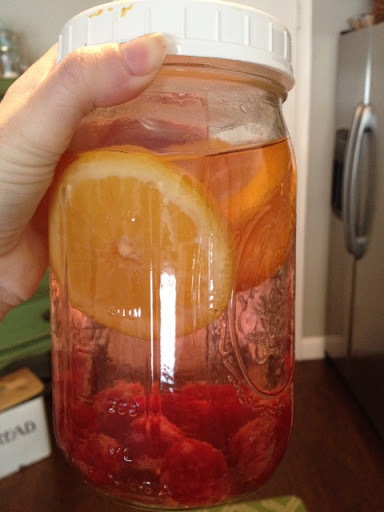 I will admit that I don’t consume enough water throughout the day so I have been starting to bring big mason jars to work filled with fruit flavored water. Here I have raspberries and orange slices. Leaving the orange rinds on made this very bitter, so next time I will leave them off! I am so lucky to work right near an Organic Avenue in NYC. they have the best raw grab and go selection that I know. 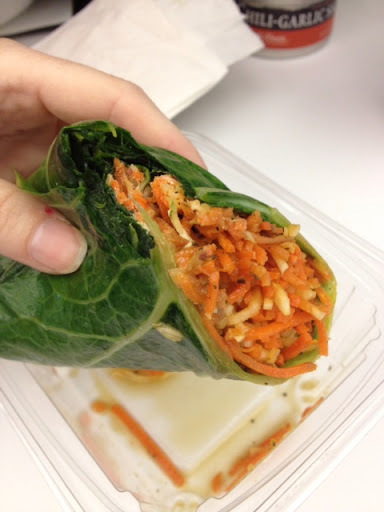 Here I have a collard wrap filled with carrots and cashew cream. They just came out with a new line of Chia Glow Shakes. 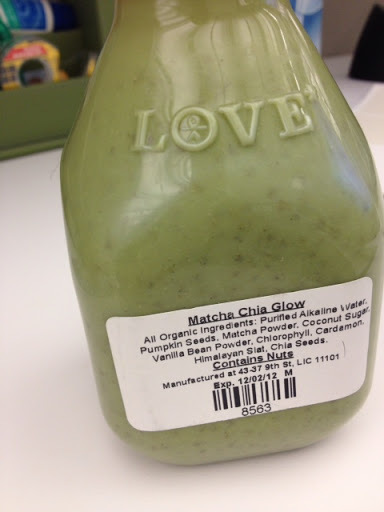 This Matcha Chia Glow was amazing!!! 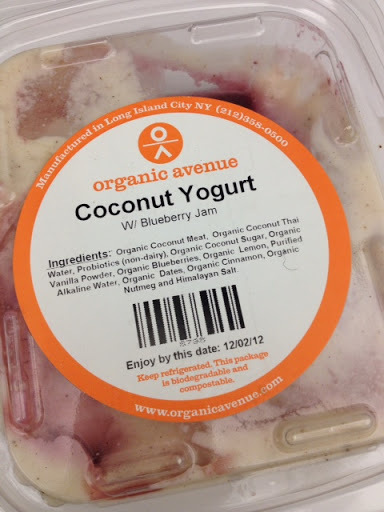 Their raw coconut yogurt blew my mind. Mixed with a blueberry jam, so creamy and just enough sweetness. I ate this as a car snack on the way home from work one night. 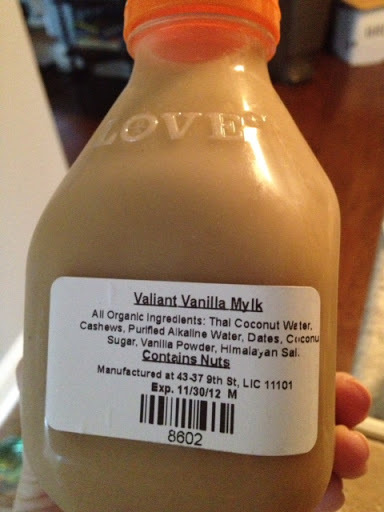 Last but not least their Vanilla Mylk is simply to live for. So dreamy and sweet, I feel like I am vanilla heaven. One night for dinner, I made large salads of romaine, celery, Bubbie’s relish, peppers, tomatoes. avocados and sprouts. On the side I served a steamed sweet potato with coconut oil, cayenne and salt. Not completely raw but very delicious lunch that I made for the both of us. (My honey loved it) Quinoa that I cooked in Black Bean Soup. 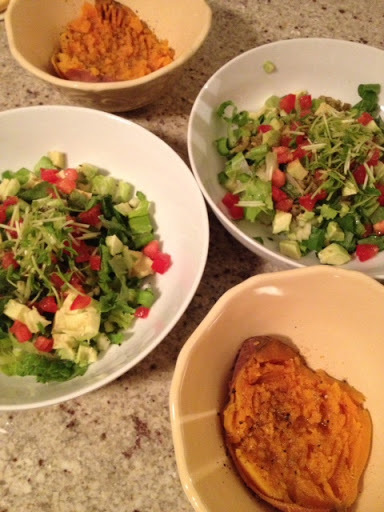 I then topped with a scoop of red pepper hummus, scallions, salsa, pepper, tomato, and sprouts. 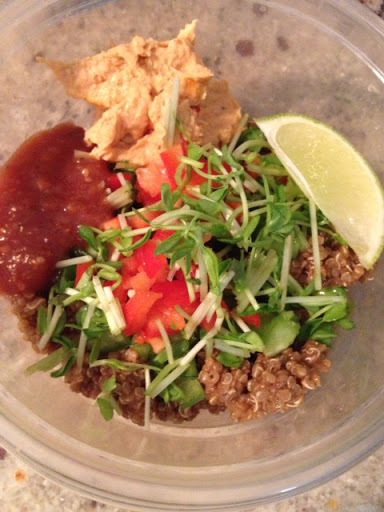 Mix all together for a creamy mexican Quinoa bowl. 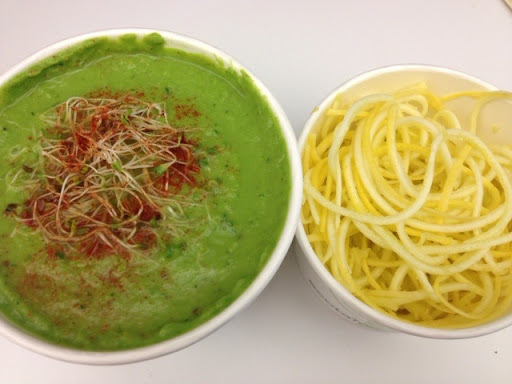 I was craving raw green soup one day so I ordered from Quintessence, a local NYC raw restaurant. I topped with sprouts and zucchini noodles. So good! 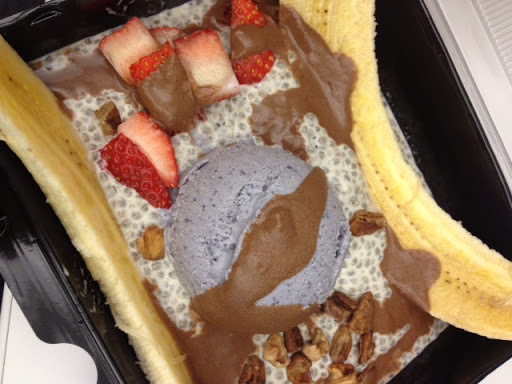 For dessert, I indulged in a Raw Chia Banana Split Ala Mode. Blackberry Ice-cream, strawberries, pecans and even a raw chocolate drizzle. DELICIOUS! 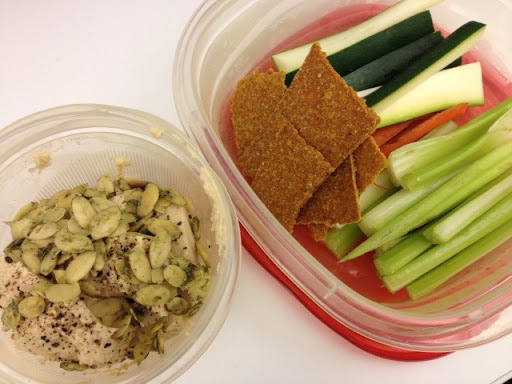 Another meal I have been loving is raw crudites and Brad’s raw crackers with hummus. I love toppping my hummus with raw sprouted pumpkin seeds and black pepper. Since I have been eating so much of it, I am going to make my own RAW hummus this week rather then keep eating store-bought hummus. Remember those orange peanut butter crackers you used to eat as a kid? 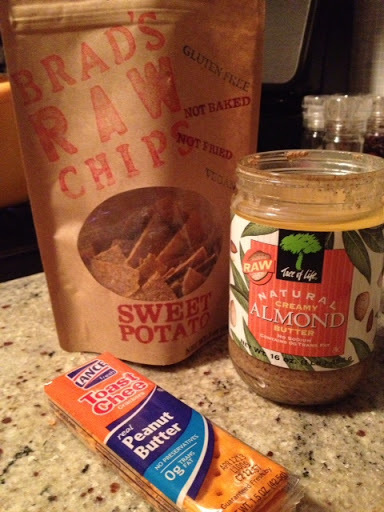 (I have them in the house because my honey still eats them) I discovered that these raw crackers topped with raw almond butter are pretty darn close to taste! Yum! I will be back in a few days with a post about Rebounding!